Title: Winning Intl: The Ultimate Business How-To Book –2005 publication. 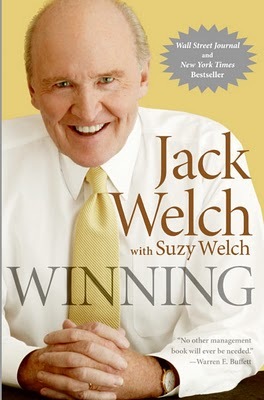 Jack Welch needs no introduction. He is the former chairman and CEO of General Electric (GE), a global conglomerate corporation. He spent his entire 40-year career since graduating with GE before retiring in 2001. In this book, Welch taps on his years of corporate wisdom and experiences in addressing some of the most common issues or questions that professionals face everyday. Organised and presented in a systematic fashion, this book is well-paced and addictive with a mix of easy-to-relate and interesting insights and stories. I like that Welch was equally honest about some of his mistakes as he is with his successes. Much of his views provides us with useful tips on how to be a better employee in contributing to the organisational’s growth. And in the same token, it also empowers one to be a better corporate leader in managing people and resources effectively. One important trait or way of doing business which Welch’s emphasises is candor. This refers to communicating with frankness or straightforwardness. According to him, the lack of candor is damaging and do not build an environment where ideas, comments or criticism can be expressed to stimulate real debate. I agree. He explains that in an organisation with a lack of candor, its people are usually remain silent in order to feel better or to avoid conflict. They sugarcoat bad news in order to maintain appearances. They keep things to themselves, hoarding information. And when an organisation has a high degree of candor, everything operates faster and better. However, Welch’s business management philosophy is not without controversies. One of them is differentiation where he distinctively categories employees by their performance: the top 20%, middle 70% and bottom 10%. But understanding the industrial era that he emerged from which formed most of his corporate beliefs, it should not be surprising that the bottom line or profits is always the main priority. That said, in today’s era, there’s a new business approach emerging and that’s the 3’p bottom line- profits, people and planet. And I believe that’s understandably lacking in his book. Nonetheless, this remains an excellent book about winning and delivering results in the marketplace from one of corporate America’s savviest minds. Who should read it: For working professionals- leaders and managers. Also applicable to church or ministry leaders.